Our Noir Publishing, 9781732086746, 402pp. Louis Kincaid is wearing a badge again -- as part of an elite homicide squad. But the return to his Michigan home comes at the bidding of a man who once vowed to destroy him. When the cold case deaths of two little boys collides with the white-hot murder of a mega-church minister, Louis finds himself fighting to unearth the secret past of his police captain -- and the demons of his own childhood. 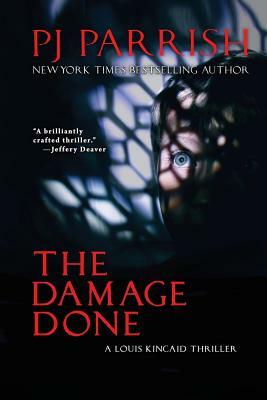 PJ Parrish (the sister writing team of Kris Montee and Kelly Nichols) is the New York Times bestselling author of the Louis Kincaid mystery series. The books are set in Florida and Michigan and have garnered 11 major mystery awards and nominations, including a Michigan Notable Book selection, three Shamus Awards, an International Thriller Writers award and an Edgar Award nomination. The authors are northern Michigan residents and are available for summer events throughout the north. — C.J. Box, #1 New York Times best selling author of THE DISAPPEARED. "For the last decade and a half, P.J. Parrish has delivered one fine thriller after another featuring the complex and compelling Louis Kincaid. The Damage Done is no exception. With a pace that never flags, dialogue that pops like a string of firecrackers, and a cast of characters so intriguing you can’t look away, this newest Kincaid novel highlights the mastery of a writing team at the top of their game."